Are you shopping for a grow light? Are your eyeballs circling in their sockets from all of the technical details presented by manufacturers? How on earth can you compare apples to apples with so many incomparable specifications being presented? It’s overwhelming for most of us. We even find that people who have been working with high pressure sodium (HPS) lights aren’t fully aware of how grow lights actually work, and therefore are missing the mark on selecting the best type of grow light for their needs. Yes, this is about to get a bit technical, so before we do that, if you are just looking for the quickest answer possible, we will tell you the secret to selecting a grow light is PAR energy. Look for a PAR (photosynthetic active radiation) number, and you’ll be headed in the right direction. Unfortunately, it’s not as simple as which light has the highest PAR number. Ultimately, you want to find the right combination of PAR value and low energy use at an affordable price. This article is focused on the science of a good grow light. We address the amazing payback equation of our Happy Leaf LED lights in the next blog post. Many people ask us “how many watts does your grow light use?” At that point, we take a breath, and start to explain why “watts don’t matter.” (Yes, of course they do matter, but they are far from the most important factor when considering how a grow light will perform.) Even some people who are more well versed in the technical aspects of grow lights are not as educated as they could be. For anyone who wants to comprehensively learn about the science of LED lights for growing plants, we highly recommend Christopher Sloper’s Second Edition Book, The LED Grow Book. This write-up is our effort to summarize the key aspects of using LEDs for growing plants. It will take less time to read this than reading Mr. Sloper’s wonderful book, but we still highly recommend his book! The sun makes plants grow because it provides the energy that plants need for photosynthesis. You may or may not remember from science class that photosynthesis is the process that converts carbon dioxide and water into sugars. Figure 1 shows the basic photosynthesis process steps. It is important for us to understand that lumens are a measure of how we (humans) perceive light and are not related to how plants absorb light, whereas PAR energy is not particularly important to us (humans) with respect to how we see light. For this reason, we should not be determining which lights we use for growing our plants based on either lumens, lux, ft-candles, or watts. These are all units of measure for how we perceive light and how much power the light source consumes to make the light we see. · Luminous flux is measured in lumens (lm) and is the total quantity of visible light as perceived by humans emitted by a source. · Lux is the number of lumens per square meter of surface area. A foot-candle is 10.764 Lux. Photosynthetically active radiation (PAR) is the energy between 400 and 700 nanometers that plants use for photosynthesis to convert CO2 and water into sugars. The measure of PAR energy is called the photosynthetic photon flux (PPF) and the units are in micromoles of photons per second. Like total luminous flux, PPF output from a grow light can be measured in an integrating sphere similar to the one shown in Figure 2. Photosynthetic photon flux density (PPFD) is a measure of PAR energy that is striking a surface. The units often used for PPFD are micromoles of photons per square meter per second (umoles/m2 second). In the horticultural industry, PPFD is measured using a PAR meter similar to the one shown on the left below. Although professional grade meters (Figure 3) can be very expensive (i.e. $1000+), hobby meters (Figure 4) have recently become available that can be purchased for less than $200. Although they may not be as accurate in measuring PAR energy, we have found that they are often within 10% of the same reading of the more expensive meters. A second measurement for PPFD is the daily light integral (DLI). This is simply the total amount of PAR energy that strikes a surface (i.e., plant leaves) over a day. This is calculated by adding together all of PAR energy over the entire day. The units for DLI are moles of photons per square meter per day. This is done by multiplying the average PPFD as measured by a PAR meter by 3600 seconds per hour then multiplying the value by the number of hours the light source (sun or artificial light) is on and then dividing by 1,000,000 to convert micromoles into moles. Watts are a measure of the amount of energy a light source consumes. Watts are not a measure of either luminous flux (lumens) or PAR energy. Watts measure what we are paying for to create the light and what our electric bill says we use (KWhr) per month. In effect, we want the watts we use to be as low as possible and the PAR we create with our lights to be as high as possible. PAR efficacy is the amount of PAR energy created by a light source divided by the power it takes to create that PAR energy. As an example, if a light source has an output of 100 micromoles per second and it consumes 50 watts (joule/second) of power, its PAR efficacy would be 2 micromoles/J. Spectral Power Distribution (SPD) charts are the graphs published by the suppliers of light sources which define the intensity of the light at various wavelengths. Because plants absorb energy between 400 and 700 nm wavelengths, we want as much of the energy from the grow light sources to be between these two wavelengths. As we will see from the SPD charts in the next few pages, LEDs, due to their relatively narrow region of transmission, have much higher efficacies (micromoles /joule) than any other type of grow light within the PAR region. Target efficiency is a measurement that provides the relative amount of light that is hitting your plants relative to the total amount of PAR energy that the fixture emits. Even though a 1000-watt HPS fixture may be generating 1500 micromoles per second of photosynthetically active radiation, if that light is not efficiently directed at your plants, much of the PAR would be wasted light, but the HPS may be doing a great job of lighting the walls, floor, or ceiling. Round-shaped HPS lights use relatively inefficient reflectors (80-90%). Because the HPS needs to be placed two to four feet above the plants due to their very high local intensity, their target efficiency could be as low as 60%. With LED light sources where the light can be evenly distributed above the canopy and the distance above the canopy can be as little as 6 inches without burning the plants, target efficiencies can be above 85%. This is a very important factor to consider when selecting the appropriate grow lights for your application. The saturation curve shown in Figure 5 provides some insights into what the limiting factors to photosynthesis include. Up to a specific level of photosynthetic photon flux density (PPFD), the limitation is the level of lighting that the plants receive. Beyond the PPFD saturation point, the level of CO2 in the environment becomes the limiting factor as shown in the same graph. For the plant to continue to grow faster, additional CO2 may need to be added. The respiration rate shown in Figure 5 is the rate at which plants consume glucose and oxygen and give off carbon dioxide and water. This occurs at night or when they are not being exposed to light. During this period, the plants are losing mass but respiration is critical to their survival. The light compensation point shown in Figure 5 is the level of light at which the plant is neither gaining mass nor losing mass but is staying steady. For many plants, this level of PPFD is roughly 100 micromoles per square meter per second. 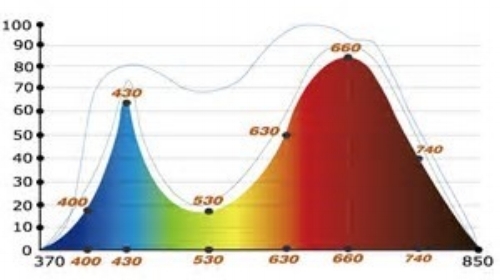 In effect, this is the level of light needed to start growing a plant, but you cannot grow most plants to maturity with PPFD levels of 100 umoles/square meters per second or less. It is important to note that this is why most fluorescent lights and low-quality LED light sources do not provide satisfactory results in growing plants to full maturity. What is the Sun’s Output of Photosynthetically Active Radiation? By the time the sun’s energy reaches the surface of the earth, about 43% of its total energy is within the visible or PAR region, while 52% is in the infrared (IR) or heat region and 5% is in the ultraviolet (UV) region. Although plants may be both negatively and positively affected by energy in the IR or UV wavelengths, they do not directly use light in these wavelengths for photosynthesis. In effect, we can say that the sun is 43% efficient at producing PAR energy. Figure 6 shows the sun’s electromagnetic spectrum with the UV, visible/PAR region, and IR regions. When the sun is not available, our plants need to rely on another source of photosynthetically active radiation (PAR). Until roughly 2010, the only practical alternatives that were available for indoor growing were incandescent, florescent, metal halide, and HPS (high pressure sodium) lights. All of these were originally designed as light sources to light our homes, businesses, and streets. They were not intended to be grow light, but they were the only options that we had available to us. After the blue LED was invented by Dr. Shuji Nakamura in Japan in 1991, the great potential of LEDs was born. The blue LED enabled us to create light that was not only blue but also allowed us to create white (full spectrum) light using a method by which a yellow phosphor is placed onto the blue LED to create all of the wavelengths of visible light between 400 and 700 nm. Until then, the red LEDs that were available since the 1960s could not be used to create full spectrum light due to their longer wavelength. In 1997, Dr. Cary Mitchell of Purdue University began his research for NASA to find a better way to grow food in outer space. His research concluded that a mix of blue and red LEDs could be used to reduce the amount of electrical power per growing area by 90 percent and by 50% over full spectrum (white) LEDs. Figure 7 depicts the human eye’s and plant’s sensitivity to specific wavelengths of light. We Want to Use More Graphs! To better understand why LEDs are able to so significantly reduce the energy requirements for photosythethis, we need to review the spectral power distribution (SPD) of the lights that we have used in the past and compare them to the SPD of LEDs tuned to the plants response to light. In Figure 8, the LED output curve is very close to that of a plant’s sensitivity to light. This is the basis of the LED's efficacy in promoting photosynthesis. A good quality LED light source has a PAR efficacy of 2 um/per J. As seen in Figure 9, a 3000 K incandescent bulb has only a very small portion of energy in the visible or PAR region. Roughly 95% of the bulb’s energy is in the IR or heat region. An incandescent bulb is not a very good source of PAR energy and can be very damaging to plants because of its very high temperatures. The SPD of a typical T5 shows that the bulk of the lamp’s energy is in the yellow/green region, whereas photosynthesis occurs most efficiently with light in the blue and red regions. See Figure 10. T5 lamps are successfully used for seed and seedling starting but if they are to be used for full plant growth, they would need to be placed very close to the plant and would consume between 3 to 5 times more energy to achieve equivalent plant production to high quality LED lighting. Typical PAR efficacy of at T5 would be 1 um/per j. The SPD of the high pressure sodium light is the closest of the conventional light sources to providing much of its energy within the PAR region as can be seen in Figure 11. HPS lamps have a very distinct yellow-orange look to them and do not contain much energy in the blue region unlike another form of HID lights called metal halide. HPS are often used during the flowering stages of plant growth. The typical efficacy of a good quality HPS lamp is between 1.3 and 1.7 um/per J. In Figure 12, the SPD for metal halide lights is shifted toward the blue region which is why they are more commonly used for the early stages of plant growth when plants are not blooming. You’ve Stuck With It This Far…. Here are some additonal factors that are important to understand: Photoperiod and how different light wavelengths effect the growth of plants at their various stages. A photoperiod is defined as the interval within a 24 hour period during which a plant is exposed to light. The reason photoperiods are so important is that many types of plants are affected by a photoperiod and will thrive if given the correct period and will struggle if given an incorrect amount of daily light. Some plants are considered short day plants and will only form flowers which bloom when the days are short or nights are long. Examples of short night plants are those that bloom in the spring or fall when the days are shorter. Several examples include rice, coffee, tobacco, cannabis, soybeans, okra, sweet potatoes, hops, rosemary, and lima beans. Some plants are considered long day plants and will only bloom when the days are long or nights are short. Examples of long day plants are potatoes, lettuce, spinach, basil, sugar beets, raddish, and swiss chard. Although we may define these plants as long day plants, this does not mean that we always want them to flower. For example, we typically want to harvest our lettuces, spinaches, and herbs like basil well before they bolt/form flowers. In effect, we may actually want to grow them in a shorter photoperiods so they do not bolt. Another group of plants are considered day neutral. Examples of day neutral plants include tomatoes, sunflowers, beans, peas, corn, and peppers. In their case, their flowering response is not dependant on the length of the day or night. Another factor the affects the size, shape, appearance, and rate of growth is the spectral power distribution (SPD) of your lights. We discussed how the SPD of each of the “grow light” options varies earlier in this article, but we did not discuss how it affects the appearance of your plants. With most of the light sources that we discussed, the SPD for the light source is fixed and it is not possible to significantly modify it. But for LEDs, this is not the case. Because LED light sources are made up of mutliple small light emitters, it is possible to tune the light in a way that optimizes the growth rate, size, taste, and appearance of the plants. Although the ratio of desirable wavelengths for ideal growth conditions may vary based on the plants being grown, a ratio of red, blue, and green light can be selected to provide the necessary light for your plants to give you great results. It turns out that a ratio of roughly50-70% red, 5-10% green, and 25-35% blue is a good ratio for how broad the leaves become, how tall the plants grow, and how the plants look to us. There is significant research being done in this area of horticulture but real world studies have shown that these ranges of wavelength ratios produce very good results. The Game is Changing, Rapidly! Up until very recently, grow lights have been so expensive and complicated to use, most people would not bother with them. The game changer is LEDs. LEDs are opening up enormous opportunities for everyone who is interested in growing plants. We see individuals who are starting to grow their own herbs and leafy greens at home, and large grow operations that are realizing the enormous savings to be gained from using LEDs. As of 2017, we hear professional growers say they are waiting for the cost of LED grow lights to come down. The message we would like to deliver is that the wait is over. We have analyzed the payback for good quality LED grow lights is actually less than one year when you factor in energy and maintenance costs. Please stay tuned for our next article, coming soon, and we’ll present the payback story.